* Moolort Plains – Australian Hobby – two individuals seen, one on Locks Lane, the other on Nicholls Bridge Rd. 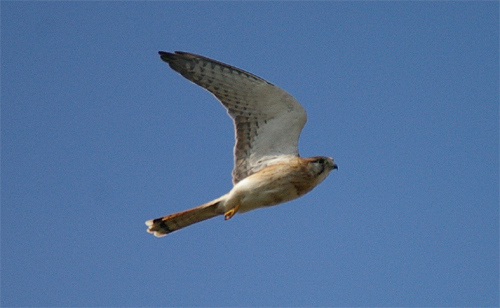 Numbers of Brown Falcon, Whistling Kite, Black-shouldered Kite, Australian Kestrel and possible Black Falcon (usual area). * Captains Gully Rd – Red-capped Robin (male) and good numbers of Flame Robins. 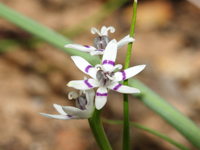 * Along Spring Hill Track [location] – Speckled Warblers in mixed species feeding flock, Varied Sitellas, Crested Bellbird (calling), Scarlet Robin, Golden Whistler (imm.) 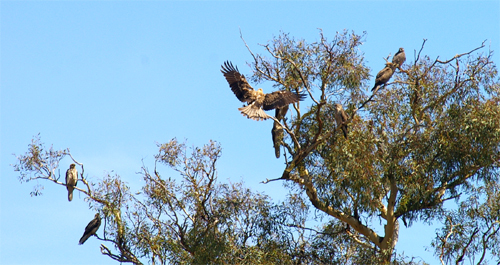 plus a pair of Wedge-tailed Eagles. * One (maybe two) Swift Parrots on Mia Mia Track – just south of South German Track t/o. * Moolort Plains, Rodborough Rd at ~ 4pm – Pair of Spotted Harriers [location], single Black Falcon [location] plus numbers of the following: Black Kite, Whistling Kite, Brown Falcon, Australian Kestrel, Black-shouldered Kite. * Eastern Spinebills along with New Holland, White-naped and Yellow-faced Honeyeaters, Eastern Silvereye, Yellow, Yellow-rumped and Brown Thornbills, Red-browed Firetail – all at 19 Wyndham St! * 5 -6 Swift Parrots along Mia Mia Track [location]. Noisy Friarbirds in mixed flocks with Red Wattlebirds. Olive-backed Orioles still calling and Dusky Woodswallows perched and soaring way overhead. * Along Mia Mia Track this morning: Purple-crowned and Musk Lorikeets, Yellow-faced, White-naped, Fuscous and Yellow-tufted Honeyeaters, Olive-backed Oriole, Brown Falcon (a bit unusual to see one in the bush! ), White-browed Babbler, Eastern Yellow Robin, Brown Treecreeper, Crested Bellbird (calling), Red Wattlebird, Crimson Rosella, Eastern Rosella. * Raptor watching on the Moolort Plains for an hour late this afternoon – Australian Hobby (1), Australian Kestrel (4), Black-shouldered Kite (6+) and a single Black Falcon on Rodborough Rd [location]. * Pair of Black Falcons on Rodborough Rd, Moolort Plains [location] plus Wedge-tailed Eagle (2), Nankeen Kestrel (2), Brown Falcon (4), Black-shouldered Kite and Whistling Kite in the same area. * Male and female Hooded Robin and male Red-capped Robin near Sheoak Hill, north of Spring Hill Track [location]. 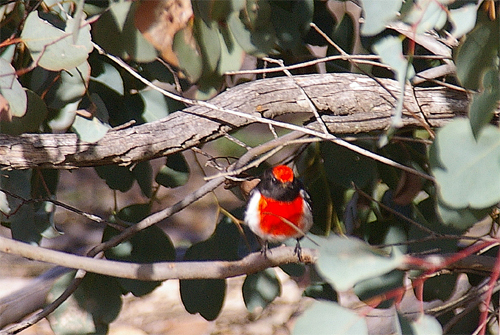 * A number of Flame Robins in and around the Sandon State Forest. A few “brown” birds on Captains Gully Rd, with a number of coloured males moving in a small flock deeper in the bush to the east of Annands Track. * Yellow-faced Honeyeaters have moved into town – small flocks around the house in Wyndham St.
* Rise and Shine Bushland Reserve – Swift Parrot (flock of 15), White-naped Honeyeater, Yellow-tufted Honeyeater, Yellow-faced Honeyeater, Red Wattlebird, Eastern Rosella, Red-rumped Parrot, Grey Shrike-thrush, Golden Whistler (imm. ), Striated Pardalote, Spotted Pardalote, Brown Treecreeper, Eastern Yellow Robin, White-browed Babbler, Common Bronzewing, Peaceful Dove, Dusky Woodswallow, Fuscous Honeyeater, Musk Lorikeet, Purple-crowned Lorikeet. * One, possibly two Swift Parrots feeding in Yellow Gum just off the highway at Campbelltown [location]. This is a well known private remnant with many large old trees. 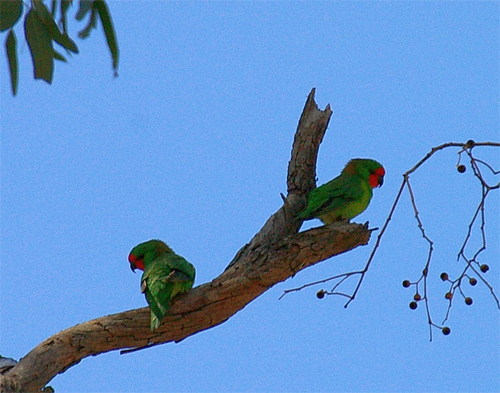 Musk Lorikeets also prominent. 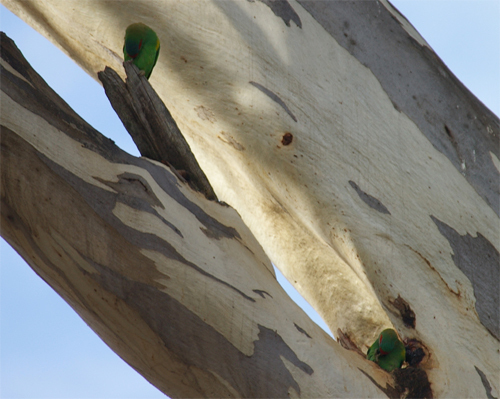 * Flock of 6 Swift Parrots flying north over the centre of Newstead at 1.30pm today. * Male Red-capped Robin north of Spring Hill Track [location]. * Between Spring Hill and Mia Mia Track – a few Swift Parrots, Olive-backed Oriole (seen and heard), White-naped Honeyeaters and Dusky Woodswallows. * Male Hooded Robin near Spring Hill Track [location]. * Female Hooded Robin east of Mia Mia Track [location]. * A few single Swift Parrots seen in the same location as yesterday plus a lone bird spotted a bit further north [location] – time of observations ~ 4.30pm. 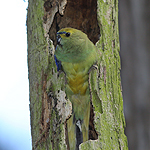 * Three seperate flocks of Swift Parrots with between 12 and 15 birds in each flock, plus a few singles. 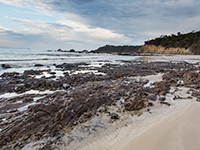 The birds were moving from the east into the firewood harvesting area on the western edge of Mia Mia Track. * A number of Tawny-crowned Honeyeaters Phylidonyris melanops were seen feeding in a plantation of ornamental eucalypts along with lots of other birds including Yellow-tufted, Yellow-faced, White-eared and Fuscous Honeyeaters, Jacky Winter, Yellow-rumped Thornbills and a single Flame Robin, the first of the season. A small flock of Black-chinned Honeyeaters also flew over. * All of these birds were then spooked by a Peregrine Falcon that cruised overhead. * White-browed Babbler – party of 7 birds feeding predominantly in a grassy area amongst the ornamental gums. * White-eared Honeyeaters Lichenostomus leucotis – a number seen and heard on private land south of the Rise and Shine. 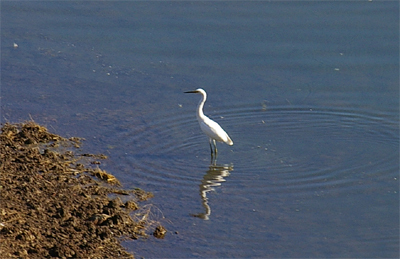 This species has been absent (or at least very quiet) since last spring. Like the Yellow-faced Honeyeater it seems to undertake a spring-autumn altitudinal movement. * A huge amount of activity this morning in a firewood harvesting area west of Mia Mia Track [location] including: Swift Parrots (first sighting this year), White-bellied Cuckoo-shrike, Dusky Woodswallow (feeding on grasshoppers), many Fuscous and Yellow-tufted Honeyeaters, Striated Pardalotes, Musk Lorikeets. Also a number of pairs of Eastern Rosellas. Later (early afternoon) saw Hooded Robin and Chestnut-rumped Hylacola. 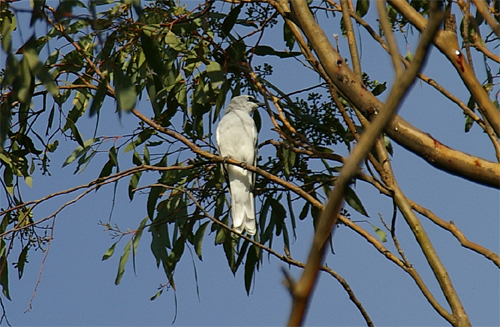 * White-browed Babblers and Peaceful Dove – junction of Spring Hill and Sullivans Tracks. * On Westons Track at Welshmans Reef a small mixed feeding flock including a pair of Scarlet Robins, 5 Grey Fantails, female Rufous Whistler, Brown-headed Honeyeater and Buff-rumped Thornbills. * Hooded Robins (pair) north of Spring Hill Track [location]. Also at same site: good numbers of White-browed Woodswallows, White-browed Babblers, Yellow-tufted and Fuscous Honeyeaters, Jacky Winter, Little and Purple-crowned Lorikeets, Striated Pardalotes and Tree Martins. * Zebra Finches – small flock on Clarkes Road, Rodborough [location]. Also on the Moolort Plains in this general area – Nankeen Kestrels (3), Brown Falcons (4), Black Kite, Australian Hobby, Black-shouldered Kite (pair) and 2 Whistling Kites over a 30 minute period. * Large group of Tree Martins; Little, Musk and Purple-crowned Lorikeets, Jacky Winter and large numbers of Red-rumped Parrots in Yellow Gum remnant on Annand’s Track – location. * Party of 7 White-browed Babblers in the Rise and Shine – favouring a clump of Hedge Wattle near the start of the trail. * Pair of White-bellied Cuckoo-shrikes on Mia Mia Track- [location] crossing paths with a family of 4 Black-faced Cuckoo-shrikes. Also heard Crested Bellbird calling ~ 200m west of here and saw Musk and Purple-crowned Lorikeets. 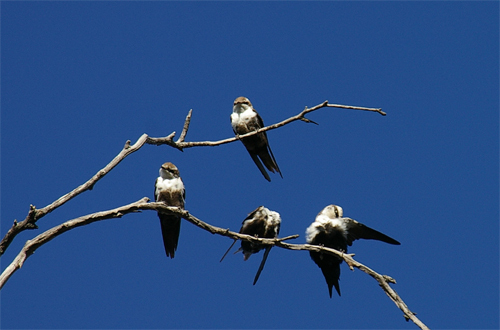 * White-backed Swallows can still be seen in the bush east of Welshmans Reef [location]. Also a few dozen White-browed Woodswallows, Purple-crowned Lorikeets and the usual honeyeaters (Fuscous, Yellow-tufted and Brown-headed), lots of Striated Pardalotes, Eastern Yellow Robin and a pair of Scarlet Robins. Crested Bellbird calling at a distance to the south-east. * Australian Shelduck Tadorna tadornoides – numerous birds in small flocks have appeared on the Moolort Plains since the recent rain. * Zebra Finches – two seperate flocks seen; the first a small group of ~3 on Clarkes Road [location] and the second on Locks Lane in same site as 12/3 but this time about 10 birds. * Musk Lorikeet Glossopsitta concinna and Little Lorikeet Glossopsitta pusilla – a number of small flocks on private land west of Annands Track – [location]. Both species were getting up close and inspecting potential nesting hollows. Also a pair of Hooded Robins, Brown Flycatcher, Restless Flycatcher, Eastern Yellow Robin, Tree Martins and the usual honeyeaters (Fuscous, Yellow-tufted and White Plumed). * Group of 8 Whistling Kites perched in a tree west of Cairn Curran Reservoir – location. * 2 Spotted Harriers at seperate locations around Rodborough Road. 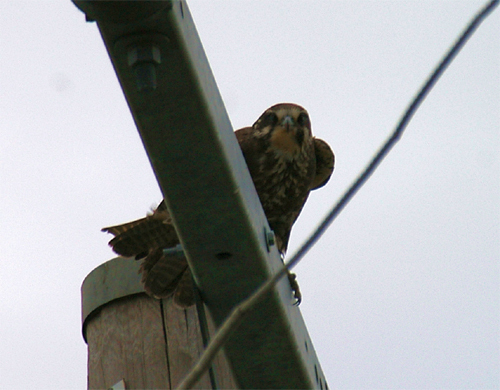 The first [location] was being harassed by a Black Falcon trying to relieve it of a food item. 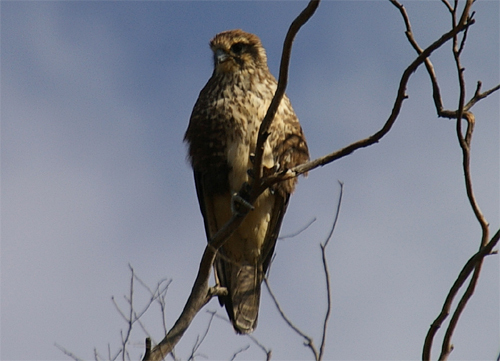 Also saw a Swamp Harrier near the second Spotted Harrier [location] , Brown Falcons, Black-shouldered Kite and Whistling Kite (where Joyces Creek crosses Rodborough Rd) in a veritable feast of raptors. Until now we have only seen a single Circus assimilis on the Plains…now we know there are at least two! 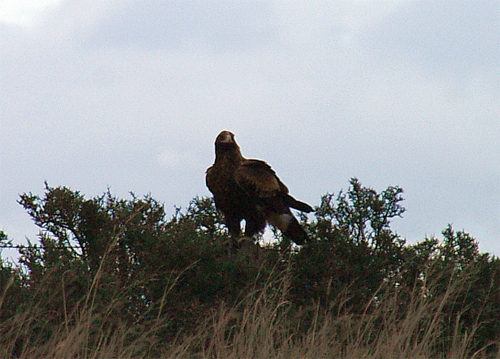 * Wedge-tailed Eagle just west of Newstead [location]. 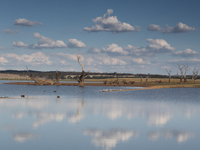 * Nankeen Kestrels, Black-shouldered Kites (nesting), Swamp Harrier and Whistling Kites on Moolort Plains south of the highway. 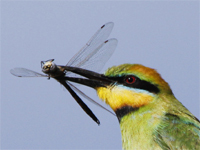 * Rainbow Bee-eaters, White -browed Woodswallows and 2 White-throated Needletails south of Gully Track [location]. * Pair of Black Falcons plus numerous Black-shouldered Kites, Swamp Harrier and Nankeen Kestrels (see post) – Rodborough Rd, Moolort Plains [location]. * Collared Sparrowhawk at Butlers, Captains Gully Rd [location]. Joan Butler has reported a Diamond Dove from the same site over recent days. This is probably a new record for Newstead. * Whistling Kite and Nankeen Kestrel at Strathlea [location] seen just before the big storm hit at 1.30 pm. 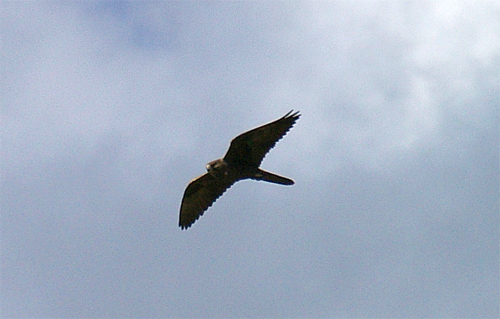 * Collared Sparrowhawk chasing small birds over the Loddon River (near the bridge) in Newstead. * Grey Currawongs Strepera versicolor on Box Track [location]. This species has been noticeably absent from the local bush over summer. * Lachie saw a Peregrine Falcon chasing Corella’s around Newstead Primary School. 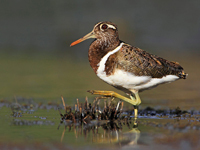 This bird has been around for a while now – obviously lots of local tucker! 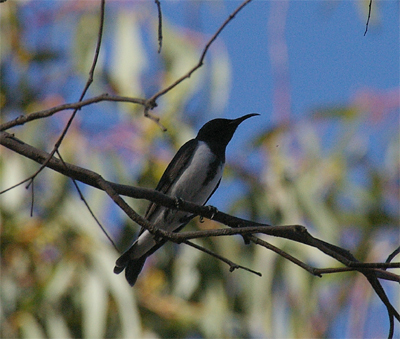 * Black Honeyeater – male observed again at the same [location] as previous sightings. Also a pair of Hooded Robins nearby. * Spotted Harrier at same site as 23/2 (see post) along with Brown Falcon, Nankeen Kestrel and Black-shouldered Kite – all seemed to be enjoying grasshoppers! 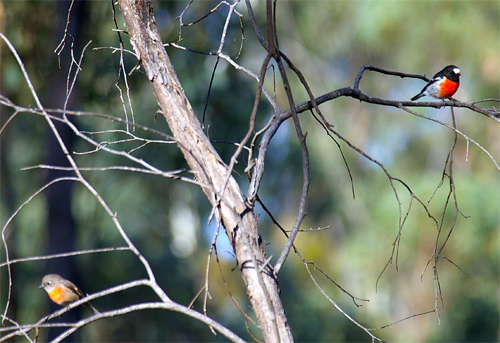 * Australian Hobby – two (possibly adult and juvenile) performing acrobatics just east of Plaistow Homestead [location].